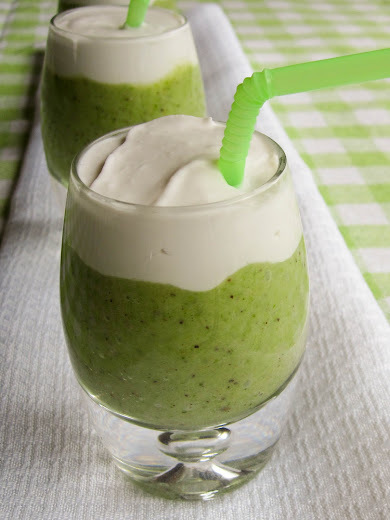 Here's a fun and healthy green drink for St. Patrick's Day made with fresh kiwis and whipped coconut cream. Skim the cream off the top of the can of coconut milk. Set aside the liquid coconut milk to put in the smoothies. In a bowl combine coconut cream, honey and vanilla. Whip with an immersion blender or hand mixer . Place bowl in the freezer to firm it up while preparing the smoothies. Cut kiwi in half and scoop out the fruit into a blender. Add remaining ingredients and blend until smooth. Give it a taste and add honey if it's not sweet enough, then blend again. Pour into shot glasses and top with whipped coconut cream topping. I wanted to make something green in honour of St Patricks Day, but without any artificial colouring. 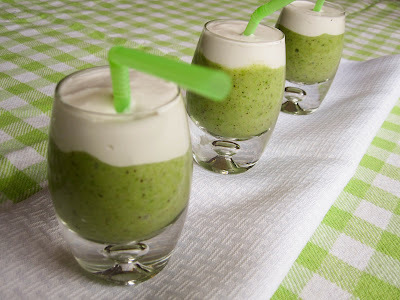 Kiwi fruit and spinach worked great in these smoothies to provide the green colour I was looking for. I found the idea for the coconut cream topping from Gracious Pantry's post on Clean Eating Whipped Cream which I thought was a clever way of making whipped cream a little more healthy (and dairy-free!). I was inspired by Gourmet Mom on the Go to use shot glasses, because she uses them in all sorts of creative ways. Until I saw her blog it had never occurred to me to use them for anything besides alcohol, but they really are perfect for kids. Sometimes kids don't want a big cup of smoothie, so a shot glass is great for them, and fun too. Cole really enjoyed slurping his green smoothie out of his little shot glass. He came back for more several times. Bennett really liked his smoothie too, especially the whipped topping. I'm sure we'll be making these again, and not just for St. Patty's Day! How to choose a coconut? How to choose a kiwi fruit?